This limited edition piece is part of the solo exhibition "Sacred Mountain" by Jerszy Seymour. Materials: Polycaprolactone wax, tempered glass. Jerszy Seymour is an artist, designer and co-founder and director of the Dirty Art Department, masters in art and design at the Sandberg Institute Amsterdam. Berlin-based artist's work ranges from industrially produced and post-industrially produced objects to the creation of situations, installation, performance and music where he is interested in ways to reconsider our inhabitation of the planet and therefore also to reconsider the inhabitation of our minds. Late 19th century painted French trestle table, 1890 Dimensions: 59 inches (150 cms) wide 15 inches (38 cms) deep 34 inches (86 cms) high. 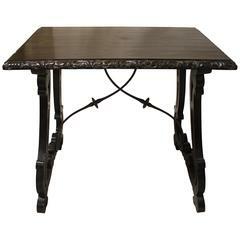 Charming French trestle table. It can be used as a writing desk or a side table. 19th century French painted oak trestle table, 1880. 18" (46cm) deep on top Dimensions: 71 inches (180 cms) wide 24 inches (61 cms) deep 31 inches (79 cms) high. Very decorative Spanish trestle table with blue painted patina one drawer.